Yesterday started off pretty early for me, around 7 or so. I took my time getting ready to leave, packed my camera and whatnot into this backpack I was given for Christmas that is made of baseball leather and has red stitching on the outside (and more room in it for things than my laptop bag has), and headed off down the street to the bus stop. It is probably pretty warm out this morning too, as people are gathering for today’s event, and it was unseasonably warm yesterday. A bit of a sprint and a short bus ride later, and I was downtown, headed for the field. I made my way through downtown towards Jimmy’s, where I’d planned to have breakfast, found a seat in the back of the bar (which was already quite full, likely of both Mariners fans and people going to the Seattle Boat Show across the street), ordered my breakfast, and relaxed. I want to say I was there around 9AM or maybe a little thereafter. I took a very leisurely bit of time to eat, then went over and planted myself in line at the left field gates around 10A. And here is where I give a recommendation; get there an hour early. Last year, Su and I didn’t get there until after 11, and the lines were insane. Get there a little early, deal with standing for a bit, and you get in in no time. After the gates opened, I had a job to do, so Su and I parted ways – she for Dugout Dialogue, and I for Select-a-Seat. I met a very nice fellow who gave me a sheet with the four options for 20-game plans (which is so much nicer and compact than the 10 or so plans they used to have for 16 games), and asked me where I’d like to sit in the stadium. I tried to get my old seats from a few years ago, but they were gone for that plan, so I settled for the two next to them. 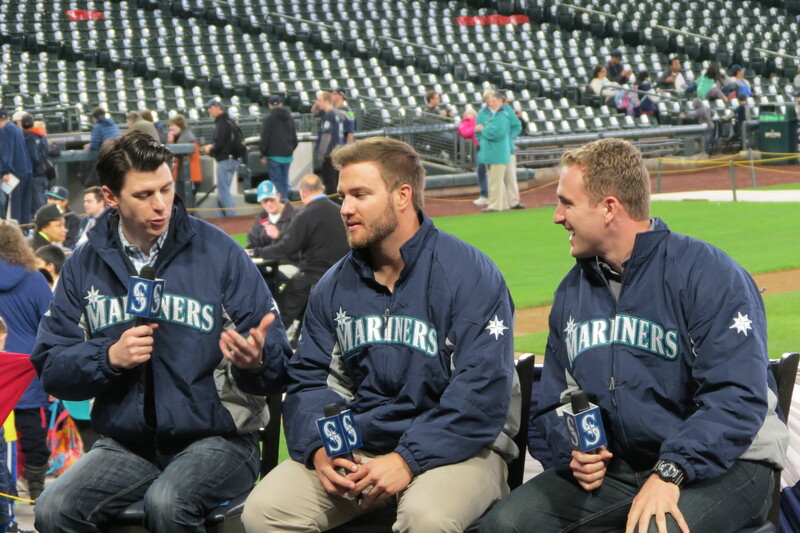 We chatted about the Mariners Fan Fest vs those of other teams. 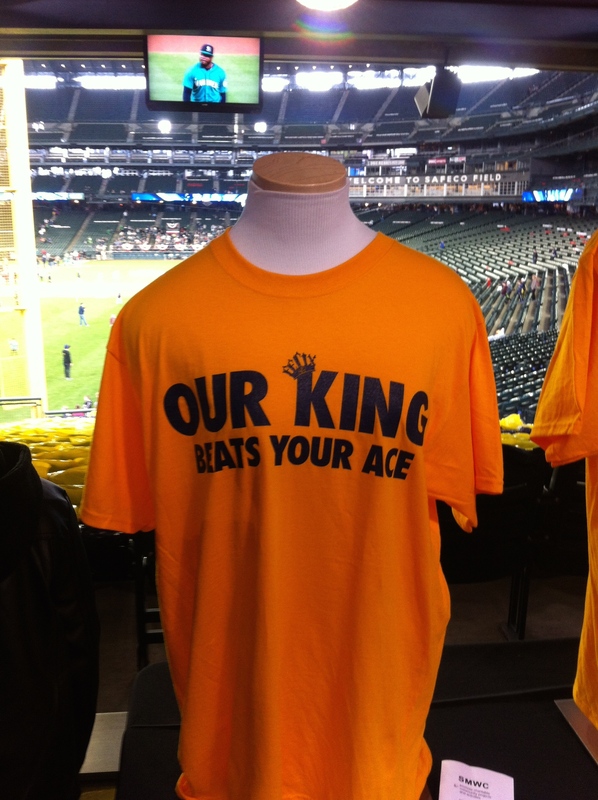 I need to say something about how good we have it in Seattle as fans. Some teams hold their yearly winter festivals for the public at places other than their home fields, and some don’t have them at all. 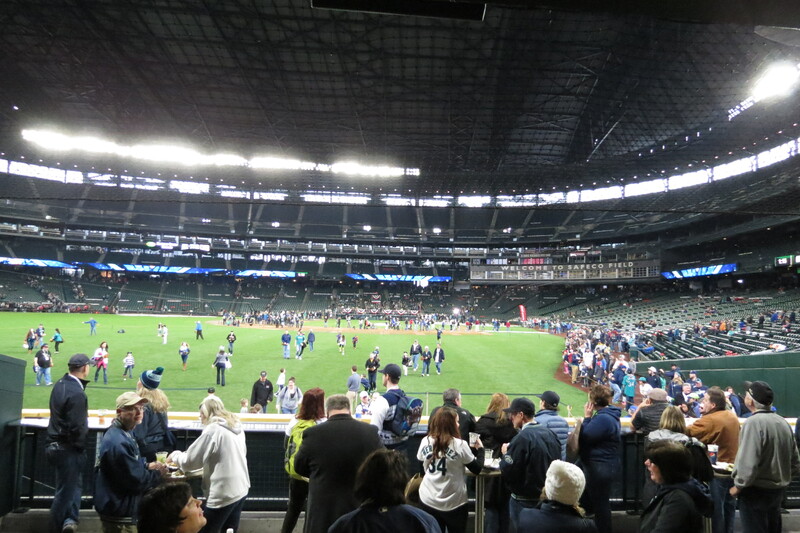 The Mariners organization has done a very nice job of opening the park and giving fans mostly free reign of the main and lower concourses, and access to parts of the field that we wouldn’t ordinarily have, like the team’s clubhouse and the rooftop control room – which isn’t all that impressive in itself, but getting to see a little bit about the park itself (rather than focus on the game) is educational at the least, and frankly kind of neat. The Mariners have also done a good job of using all the main bits of the park; tons of bouncy houses for kids around the main concourse, zip line in right field, tee ball in center, and catch in left, with the ever-present ROOT Sports news desk by home plate, and the ability to walk onto the field from first base to third and the visitor’s dugout; something I do just about every year and never get tired of. So yeah. We have it pretty good here. That is a rough picture, and I apologize; cell phone and me trying to stay out of people’s way. In any event, this is being taken to Arizona to meet up with the Seahawks in their Super Bowl endeavors. Normally, I wouldn’t think twice about this; but since it looks like history is being made, I decided to sign it, in the lower left corner (was not signed when this picture was taken): Go Hawks! 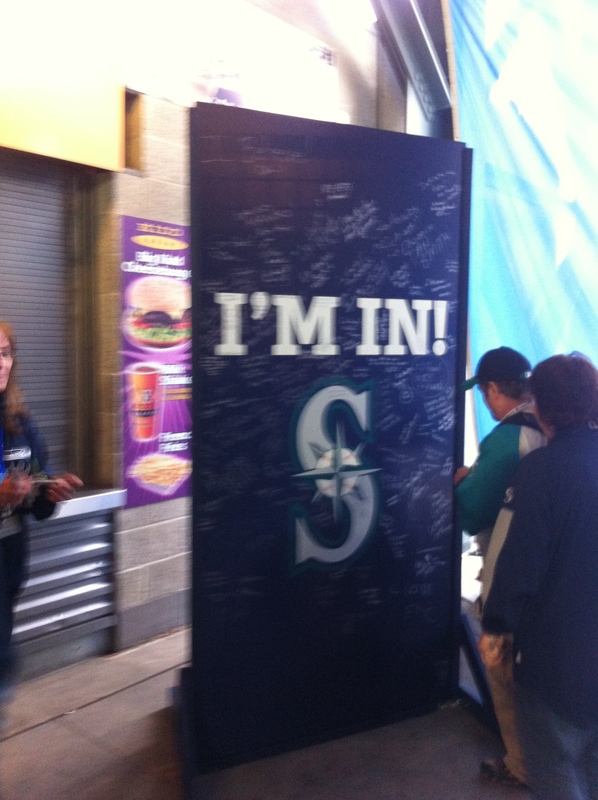 Go Mariners! and then the scribble that passes for my signature. Several hours later, we would walk back past this thing, and there was barely any room on it. People were signing on the back. They’ll need another one for today’s event! I took a stroll around left field and the third base side of the park, where there were several organizations set up for charity donations, joining or supporting local baseball and softball organizations, the 710 ESPN booth, a kiosk where you could buy game-used gear, one where the Diamond Club was set up with chairs and tables (probably the closest I will ever get to actually being in the Diamond Club), and finally I located Su sitting over the Mariners dugout waiting for the next folks to show up and talk at Dugout Dialogue. 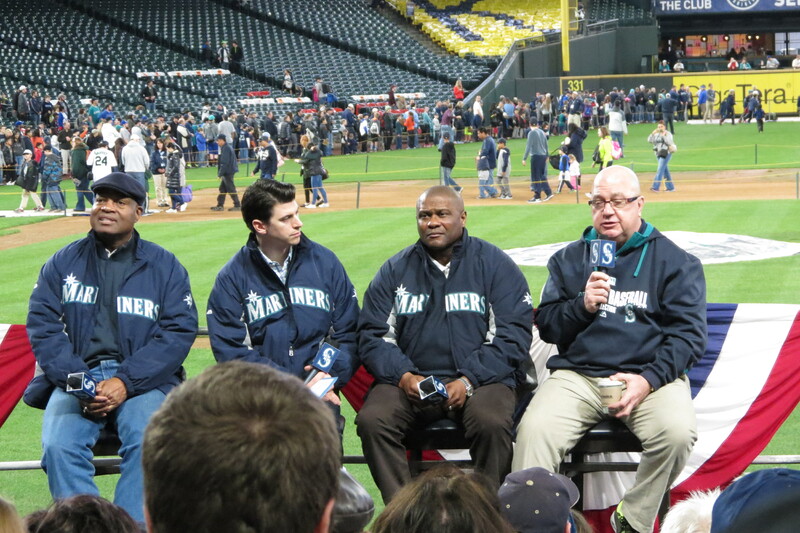 Next up to discuss the game was Jack Zduriencik and Lloyd McClendon, who sat down and responded to questions from Dave Sims, Aaron Goldsmith, and then the audience at hand. 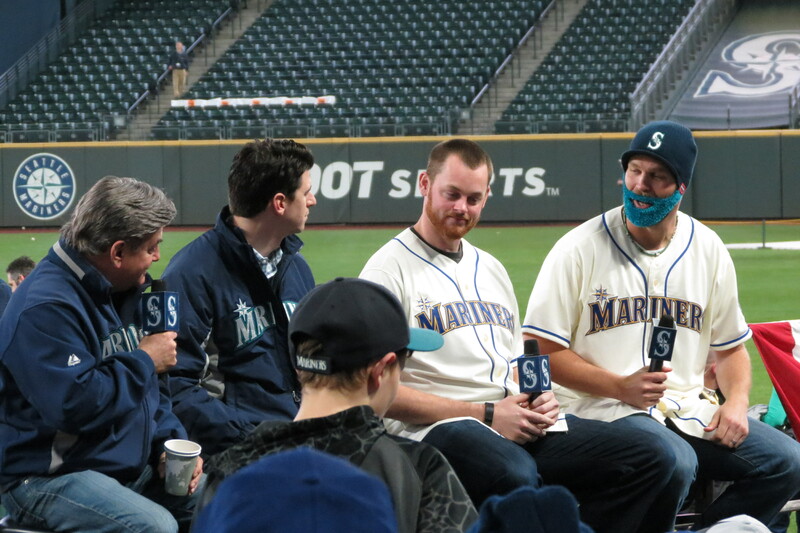 Two of the questions of note were about Ichiro and Michael Saunders. A fan asked what basically amounted to a question that placed some degree of assumption on the front office having even looked at bringing back Ichiro as an option. Zduriencik handled it well. 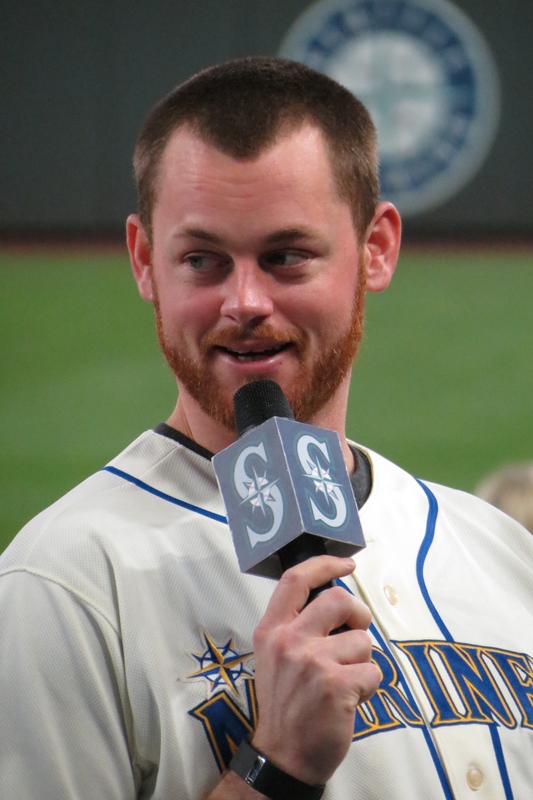 He basically stated that Ichiro was never an option for this club this year, while still maintaining the degree of respect they have for the player and his game. On the record, I’m just going to say that if Ichiro ever plans his last year, I really hope they do something as a feel-good signing for his last season here, like they did with Ken Griffey Jr. He might not play in the capacity we’re all used to seeing, but it would be nice to have him back one last time. 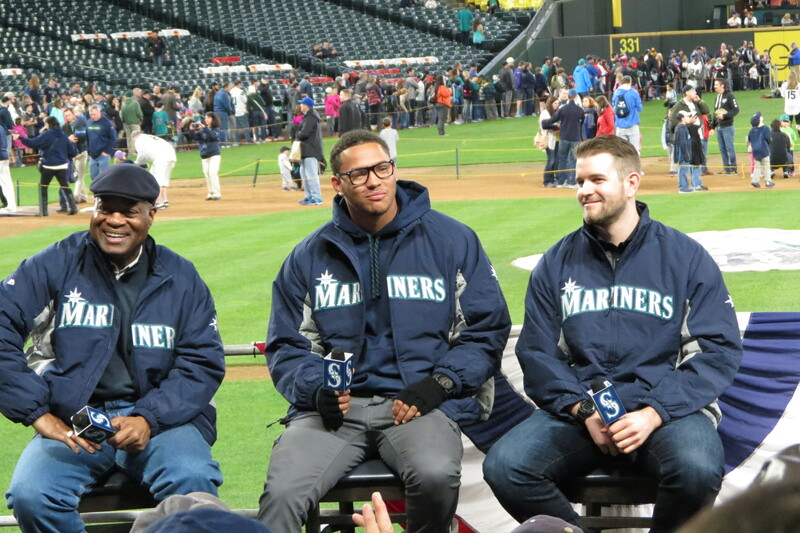 A kid next to me asked a question about how McClendon plans to use the outfield, and as names and positions were rattled off, my brain went to “Hey, what about Michael Saunde- aw man!” Immediately after this, someone did ask a question about why Saunders wasn’t kept, and Zduriencik said that while they did like Saunders, we had a need for starting pitching, and thus JA Happ was acquired in that deal. No drama, just straight up fact. If you’re looking for controversy, Jack’s not going to give it to you. 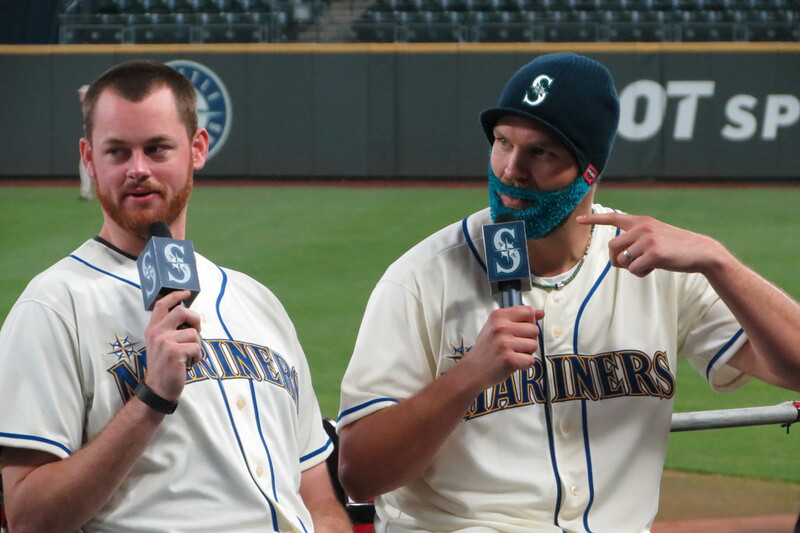 Next up were Taijuan Walker and James Paxton, with Walker sporting some new frames and a sweet pair of fingerless gloves, though honestly I was sitting out there with only a sweater on. It was a nice day yesterday. Even texting and using Twitter, my own fingers stayed pretty warm. First time ever; usually during this event it’s 30F and raining out. 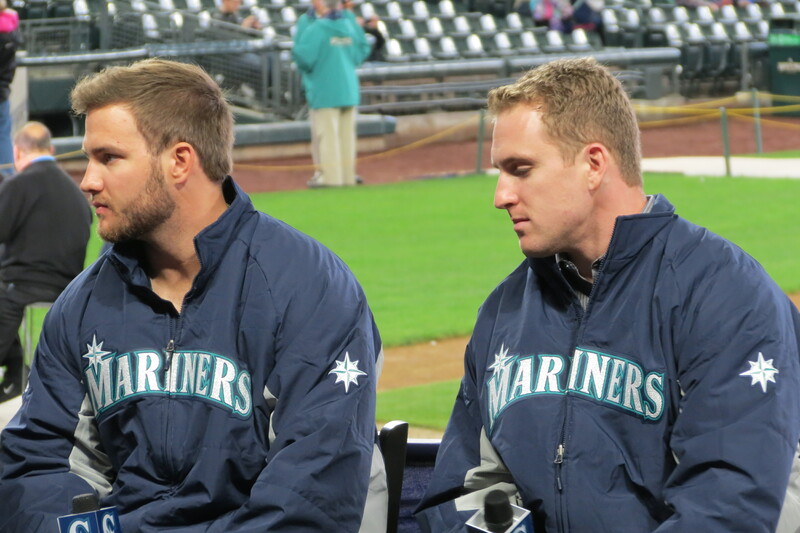 A short break later, and Brad Adam appeared, as did Austin Jackson and JA Happ. Full disclosure, we didn’t stick around for this one. Su was hungry, and I wanted to check out The Pen, so we left about midway through, with JA Happ giving some praise to Jackson for his fielding work. We wound through a maze of bouncy houses, a line to have your picture taken at “Let the Arrow Fly” out near the Moose Den (basically, there is a dirt mound, some grass, a photo background, and you do the Fernando Rodney thing), then the Moose Den itself. I recovered a schedule from Select-a-Seat so I could let my friend Eric (Red Sox fan) know when he should avail himself for a Sunday game against Boston, Su cast her vote for the Felix shirts, and then we went downstairs to Edgar’s and watched adorable tiny children play catch with their parents. Su got a bacon-wrapped hotdog and a beer, my friend Tom and I had beer (breakfast was huge, I did not need lunch in the least), another Tom showed up and we chatted a bit about this and that, and after Tom #2 left, the three of us stood around and chatted until we realized that it was almost time to see Nelson Cruz take some questions. So back upstairs, another walk around the third base side of the park, and back to the dugout! 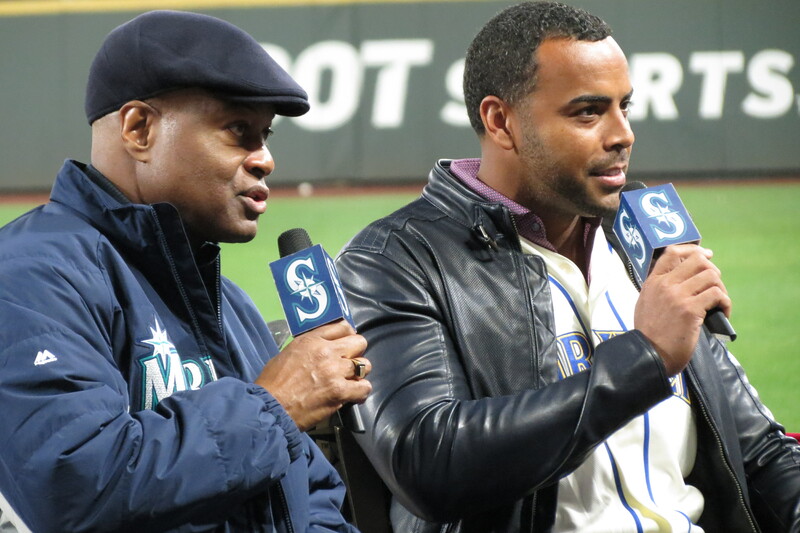 Cruz was just settling in with Dave Sims, and the three of us snuck in as close as we could. Cruz was asked about everything from how much he liked it here to how he felt about our facilities in the Dominican Republic, to not having to play against Felix. 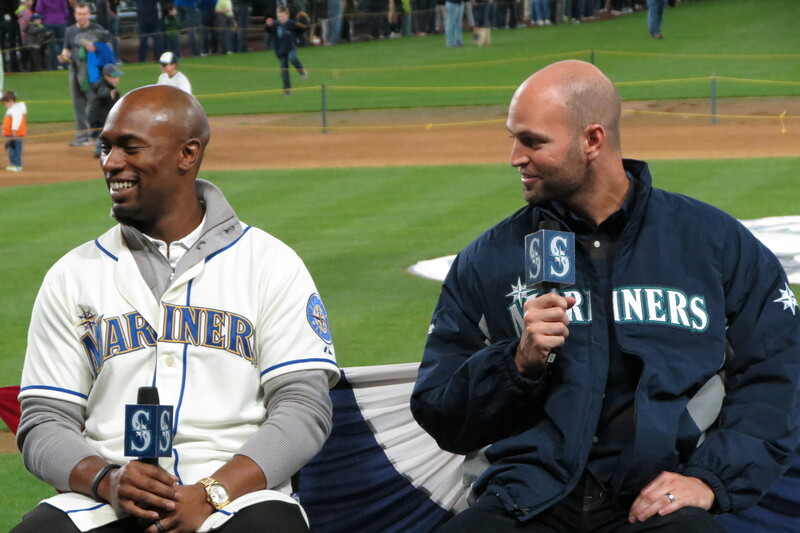 Cruz said he was very glad to not have to face Felix, and also not to have to deal with the “Ks in left field“. While part of me thinks it was just a friendly appeal to his new fanbase, part of me would love to think that having 200 people yell for your failure might get into a player’s head eventually. Cruz said that while people in the DR do wear Mariners gear, fans are more likely to follow individual players, rather than a whole team. I got the impression that the team’s baseball-building facilities in his country might be doing some good for younger players who really want to make it to MLB. Next up were John Hicks and Alex Jackson (who will eventually trip me up with Austin Jackson), two of our minor leaguers. Jackson is 19. 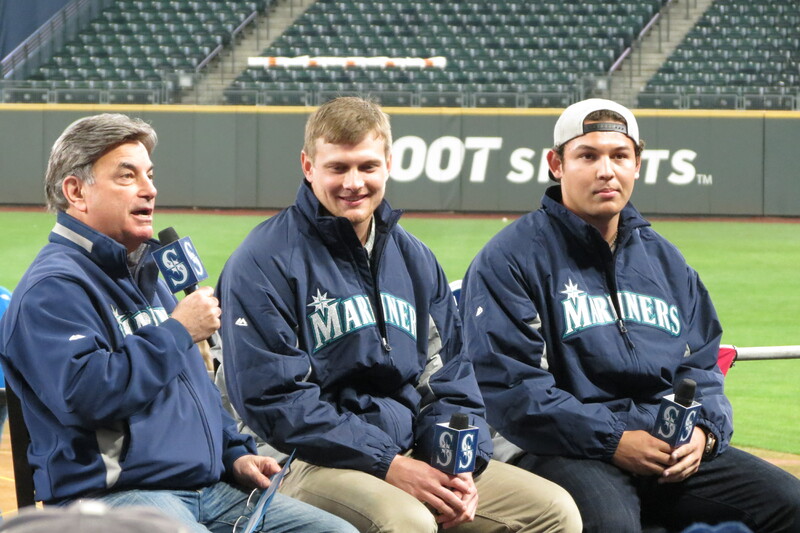 Rick Rizzs hosted them, and the fan Q&A seemed longer than the previous sessions. Wonderfully enough, almost every single question asked of these two were asked by children, both boys and girls. Some of them were serious, some were just sweet, but it was nice to see so much interest in the game from a younger generation. Hicks and Jackson, for their part, seemed a little nervous on the dais, but I am sure they’ll get better and more comfortable with practice. 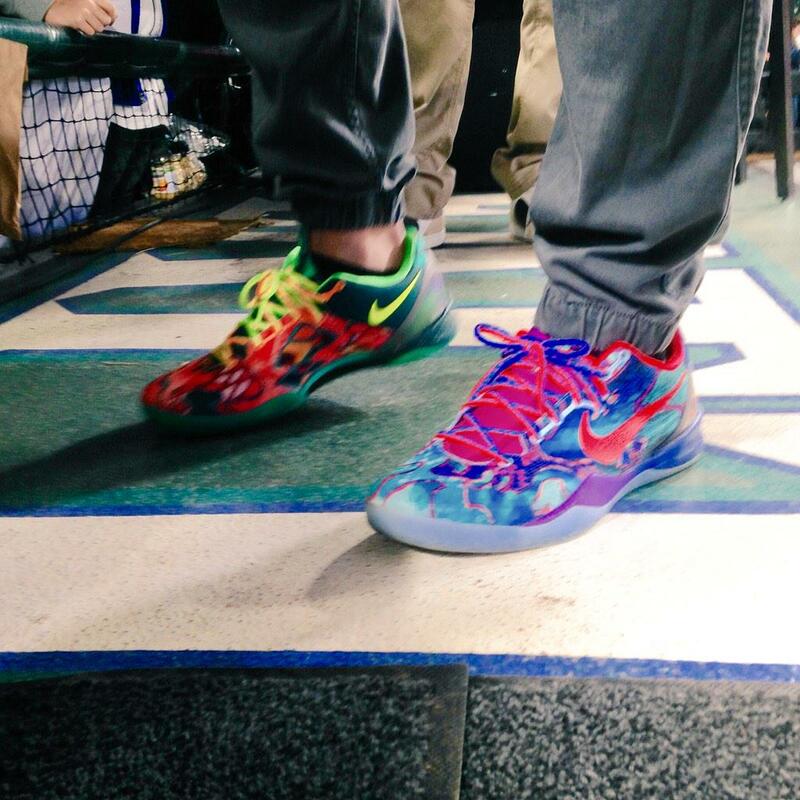 They put these two together last year, and it was a huge hit for those in attendance. 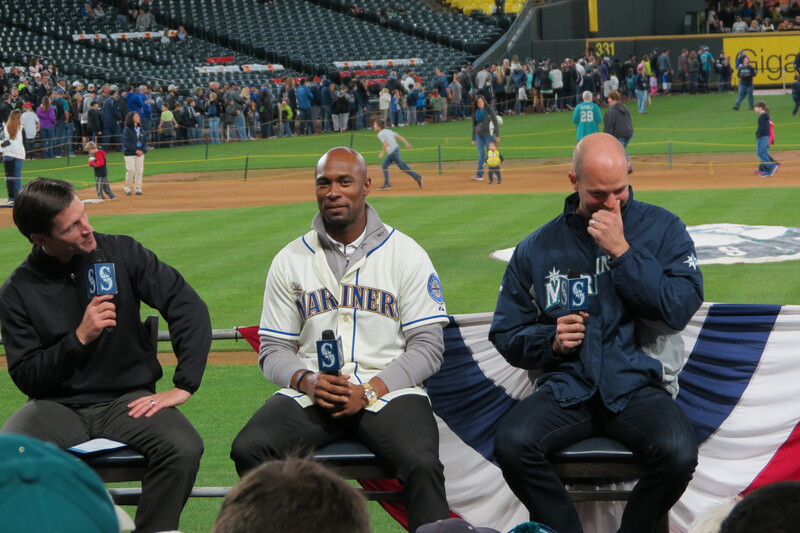 Lots of joking around with Rizzs and Goldsmith and each other. 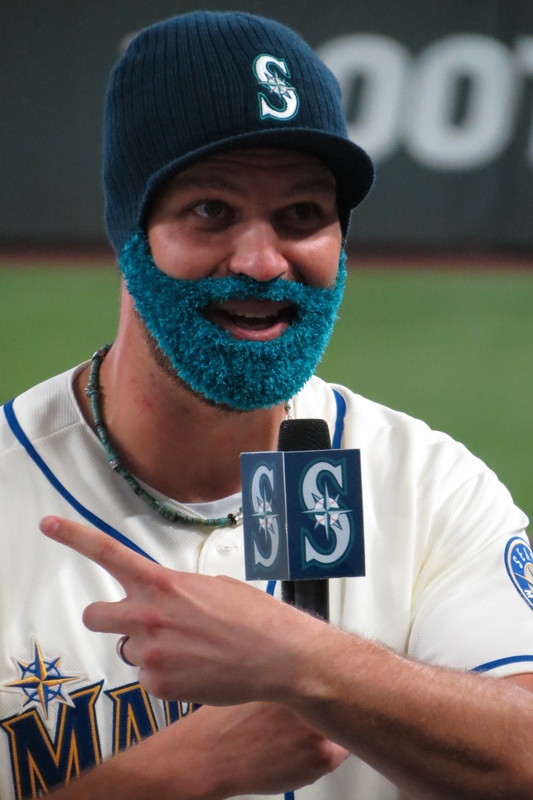 Wilhelmsen kept the beard hat on for longer this year than he did last year, but so far has not made it through an entire interview with the thing on. There is a small chance that both of these videos may be pulled, because somehow me posting a few seconds of a song violates someone’s copyright rules (and you can’t have fun on the internet), but I hope that people can enjoy them if at all possible. If not, there are better copies of said events filmed by the Mariners themselves here, and those are also one after the other, with better sound and film quality than my Canon. Any way, much fun was had, and I don’t remember a whole lot of what was said because I was either laughing or lamenting the fact that I am really going to miss these guys when they’re gone. But for now, I will enjoy them as much as possible while they’re here. 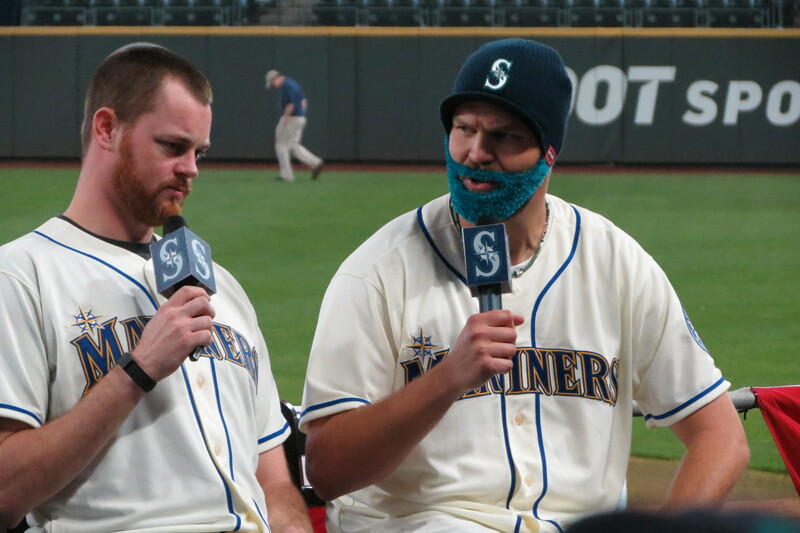 Our bullpen is still pretty weird, and I love it. The last two speakers for the day were DJ Peterson and Patrick Kivlehan, and yes I had to look that last one up just to be sure on spelling. Their segment was much lower key than their predecessors, and they spoke about their careers so far, and coming back from various injuries. Also, thanks to a girl sitting in back of us at the time, I now know that Kivlehan’s favorite food is strawberries, while Peterson prefers Mexican food of all kinds. Peterson was also asked by a boy sitting in a row in front of him whether or not he would ever get his hair cut like “The Boz”. Much shock all around initially, as I think most people have more or less forgotten about Brian Bosworth and his antics from the 1980s, and Aaron Goldsmith was impressed the kid even knew the name. Peterson declined, he likes his hair just fine the way it is, thank you. After a quick sweep downstairs to see if we had missed much of anything in the clubhouse level, Su and I went back to her car and tooled back over to my neck of the woods in West Seattle, where we dropped some stuff off at the house and then proceeded to Beveridge Place for some beer and food. We were joined by one person from LookoutLanding, Cody Morris, part-owner and brewer for Gastropod Brewpub, and soon a new location in South Lake Union (which will apparently feature Indonesian food, I am looking forward to it). We did talk about baseball and football, but I’ve always been interested in the art of brewing beer, and I learned a lot from him over the course of the evening. A few of my friends randomly showed up there just because they were looking for some place to go, and we had a table of beer, pizza from Peel and Press, and lots of good discussion. A great way to end an excellent day. Lastly, for those of you who might be worried about the new takeover of Elysian Brewpub by Annheuser-Busch, don’t be. Things are going to stay the same. I would go into that more, but this isn’t a beer blog. Just rest assured that your beer and food will remain untouched by the large corporations; though they may have to get rid of that Loser Ale, for obvious reasons. For anyone going to FanFest today, have a great time. I hear the temperatures are supposed to be over 60F today, and maybe they’ll open up the roof! Go Mariners! Yep, those are the ones. Wow. I don’t know how, but I forgot about those until someone pointed out on Twitter the other day that Walker was wearing these fire engine red ones on Sunday. Thanks so much for writing this up! I especially like just how many things there were for kids, and how engaged the kids sounded. And worth the price of admission for the 2 snippets you got on video apparently. I was keeping an eye out for you guys. 🙂 Sorry you couldn’t make it, too! I should have gone on Sunday as well, seemed like a lot more people I know went Sunday, but I just couldn’t make it.